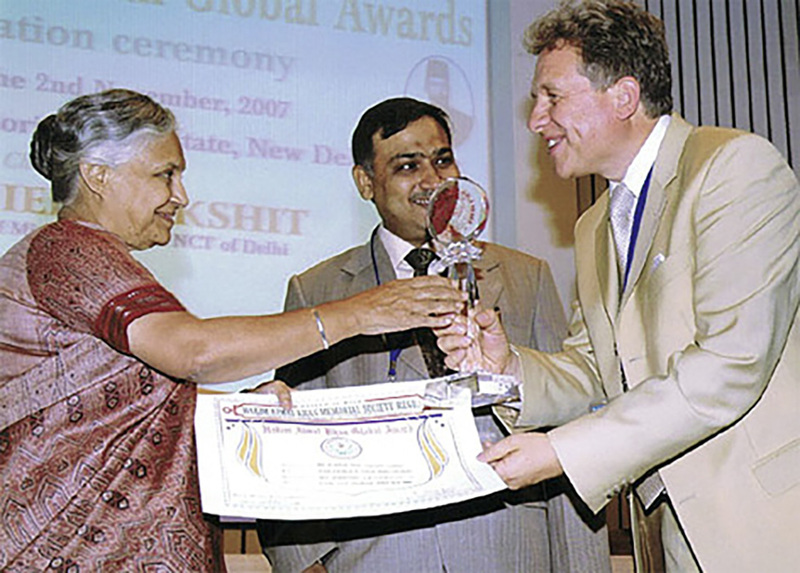 On November 2, 2007 Lothar Pirc received the “Global Hakim Ajmal Khan Award 2007” in the Indian capital of New Delhi. During the grand celebration with 250 invited guests in the ballroom of the Ministry of State, Smt. Sheila Dixit, Prime Minister of the Indian State Delhi, presented the award to the representative from the health resort on the Lahn River in Rhineland-Palatinate. Lothar Pirc is the co-founder and CEO of the Indian Ayurveda medicine specialized Maharishi Ayurveda Health Centre Bad Ems. 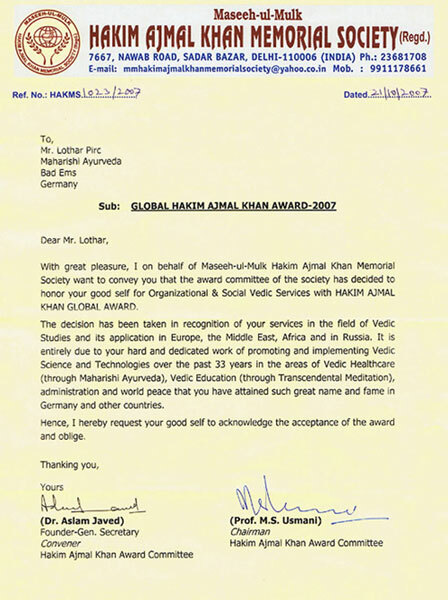 After the introduction from Dr. Aslam Javed, Secretary General of the Indian Hakim Ajmal Khan Memorial Society (HAKMS), the decision for the award 2007 in the category “Organizational & Social Vedic Services“ was made in recognition of the efforts and services in research, application and distribution of Vedic Sciences in Europe, the Middle East, Africa and Russia. The award committee particularly emphasized the dedicated contribution of Lothar Pirc during the past 30 years in the area of health care through Ayurveda, mental health through the Transcendental Meditation program, and his efforts to create world peace through the Vedic approaches. For several days following the celebration, which was attended by members of the press, Lothar Pirc conducted a program for the exchange of knowledge and experience. This included a lecture to the medical students of the Hakim Ajmal Khan Tibia College. Together with several Indian Ayurveda doctors, he had various discussions with the Health Minister of Delhi, as well as with representatives and authorities, to further deepen the collaboration of the German and Indian Ayurveda institutions. He also visited health facilities and hospitals that practice Ayurveda or modern medicine.